a writing position. Although he is a writer for the newspaper, he wants to attend UC Santa Cruz to study international relations. With his urge to get away from LA his dream job is to work for foreign embassy because he would then get to the chance to travel to different destinations and represent his country. As he aims to achieve those dreams, he also enjoys listening to alternative rock, electric, and Spanish rock, as well as watching films and learning new languages. He is already fluent in both English and Spanish but is currently learning Portuguese and French, with his interest and ability to speak multiple languages, it should help him as he tries to achieve his dream. 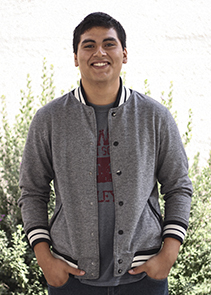 This young writer began enjoying to write his sophomore year, “I like that I am able to express myself through writing and there's something about having a pen and paper in my hands that makes me feel powerful,” Martinez said. He also believes it is important to voice your opinions and keep the student body informed. With his passion for writing and his care toward the newspaper’s readers, he is an important asset to the staff.